Fashion designers like to make bold and shocking statements with their work, but one designer has taken the aim little more literally. 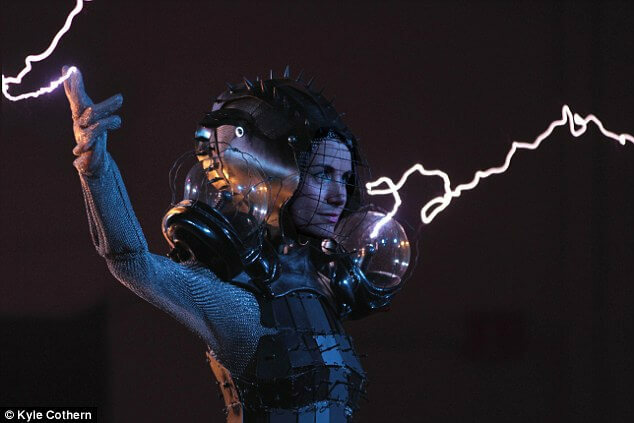 Dutch artist Anouk Wipprecht created a dress made from metal and used it to conduct electricity from two giant Tesla coils. Made entirely from chainmail, Ms Wipprecht wore the dress on stage and conducted almost half a million volts as she stood between the coils. The dress consists of a spiked helmet and plate-metal dress secured underneath 600 metal rings. It was created in partnership with band ArcAttack, which makes music using Tesla coils. A Tesla coil is an electrical resonant circuit that produces high-voltage, low-current, high frequency electricity. HOW DOES THE DRESS WORK? The dress was created by Dutch designer Anouk Wipprecht in partnership with band ArcAttack, which makes music using Tesla coils. It consists of a spiked helmet and plate-metal dress secured in a head-to-toe suit of chain mail. A Tesla coil is an electrical resonant transformer circuit that produces high-voltage, low-current, high frequency alternating current electricity. When Ms Wipprecht stood between the coils, the metal in the dress conducted this energy. The chainmail acted like a Faraday cage, to push the charge to the floor, which protected her from the electricity. It features two main sets of windings – a primary, input, and a secondary output. Each is made up of a capacitor and an inductor, so they become resonant circuits when voltage is passed through the coils. The primary winding pushes the voltage through to the second winding, via a spark gap, and this creates the bolt of energy. A Tesla coil (pictured) is an electrical resonant circuit that produces high-voltage, low-current, high frequency electricity. It features two main sets of windings – a primary, input, and a secondary output. The primary winding pushes the voltage through to the second winding, via a spark gap, and this creates the bolt of energy. When Ms Wipprecht stood between the coils on stage, the metal in the chainmail dress (pictured) conducted this energy and pushed it towards the ground.The chainmail worked as a Faraday cage – which uses its mesh-like structure to move electrostatic charges and pass them around the outside of the ‘cage’. When Ms Wipprecht stood between the coils on stage, the metal in the chainmail dress conducted this energy and pushed it towards the ground. The chainmail worked as a Faraday cage – which uses its mesh-like structure to move electrostatic charges and pass them around the outside of the ‘cage’. This allowed Ms Wipprecht to engage with the arcs in person, while being protected beneath. Ms Wipprecht (pictured testing the dress) said electricity travels the shortest path to grounds, so basically the dress functioned to lead the electricity directly to floor instead of raising through her body. She added the challenge was to create an iconic design that would hold up to the power of high-voltage electricity. The project was demonstrated on stage during the MakerFaire 2014 in San Mateo. Ms Wipprecht said: ‘The problem arose when we could not find a model, and I had to sacrifice my own body for science by standing in between the coils’ (pictured). A Tesla coil (pictured) is an electrical resonant circuit that produces high-voltage, low-current, high frequency electricity. The project was demonstrated on stage during the MakerFaire 2014 in San Mateo. ‘We both are obsessed by pushing boundaries regarding technology, experimentation, and innovation so that made a good spin-off,’ Ms Wipprecht told MailOnline. ‘We don’t only want to show off a cool project – we also want to educate the viewers by sharing our process to engage and inspire them in the technological facets. ‘Wearing the dress I was standing in between two giant Tesla coils that each level up to half a million volt of raw electricity. ty directly to floor instead of raising through my body. Ms Wipprecht said the challenge was to create an iconic design that would hold up to the power of high-voltage, low-current, high-frequency, alternating-current electricity. ‘Since we are all experts in what we do, it was no problem to create a dress like this – me as fashion tech designer playing with the boundaries of technology, and ArcAttack as leading inventors of these kind of circuits.